In this article we investigate the status of two different types of movement in subordinate clauses in Faroese: the movement of the finite verb to a position below the subject but above negation and medial adverbs (V-to-I), and the movement of some XP and the finite verb to positions above the subject (V2). The exact status of these phenomena in contemporary Faroese, a language that has been argued to be undergoing syntactic change, is a matter of dispute; we attempt to clarify this using the methodology of Magnitude Estimation (ME). 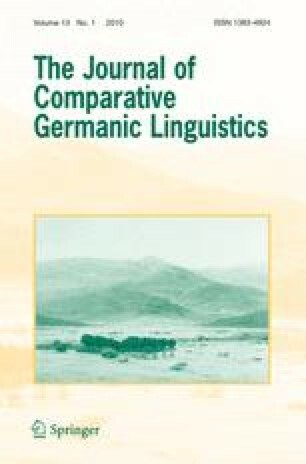 We extend what is known by presenting the results of a systematic comparison of judgment data from Icelandic (where the finite verb obligatorily moves to a high position within the clause, and embedded V2 has been claimed to be possible quite generally), Danish (where the finite verb obligatorily remains in a low position, and embedded V2 has been claimed to be restricted), and Faroese (where the status of verb movement is precisely at issue, and the availability of embedded V2 has been little explored). Electronic supplementary material The online version of this article (doi: 10.1007/s10828-010-9035-7) contains supplementary material, which is available to authorized users.